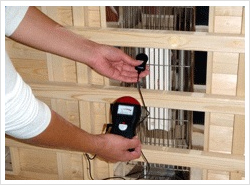 Infrared Sauna EMF (Electrical Magnetic Field) Readings – what is it and its importance. It is not disputed that electromagnetic fields above certain levels can trigger biological effects. Experiments with healthy volunteers indicate that short-term exposure at the levels present in the environment or in the home do not cause any apparent detrimental effects. Exposures to higher levels that might be harmful are restricted by national and international guidelines. EMF (electromagnetic field) is practically non-existent in the INFRA-CORE and Horizon Models due to the fact that the wire changes direction several times over the the face of the heater, thus canceling out most of the EMF than any other heating emitter on the market. The watt density of the INFRA-CORE emitter is proven ideal for providing the users with the highest output of far penetrable infrared at the most beneficial micron range for the human body. As you can see from the chart below found which is taken from a competitors website, shows the comparison of the many infrared saunas on the market, but they fail to add INFRA-CORE sauna readings onto the chart for comparison. WHY? INFRA-CORE EMITTERS are one of the lowest EMF emitting heaters available in a Far Infrared Sauna. 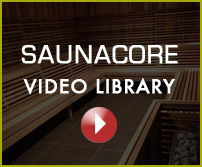 The concave solid ceramic emitters used in an INFRA-CORE or HORIZON model far infrared sauna by SAUNACORE are by far the most efficient radiant heaters on the market. The heaters are manufactured to fully comply with all EEC electromagnetic compatibility directives in Europe and North America. They are extremely low in EMF output. The main reason for this is the low wattage ceramic heater SAUNACORE uses, the thickness and density of the ceramic emitters is the key factor. The nichrome wire is cast directly into the ceramic in a concentrated pattern which loops back and forth, which has a highly effective Far Infrared Output but cancels out the EMF output. Saunacore far infrared sauna emitters EMF output is low to almost non existent within the infrared sauna. The heaters EMF is well below the recognized level of risk.